With the inevitable chill of a northeastern winter comes the joy and excitement leading into the holidays and the new year to come! But your floors may be experiencing a different kind of emotion: that of fear as they absorb the wet snow, begin to stain and start growing mildew and mold. And if you think the road salt melting the snow outdoors makes your floors immune to this problem, you could very well have splintering, discolored floors in your future, as the pH of the salt is just as damaging as the melting ice. It’s time to banish pesky salt stains, snow and ice from your facility. 1. Melted ice and snow can damage your floors. Granted, moisture can have varying impacts on your wallet depending on the type of flooring that your business has. But that doesn’t mean that water can’t damage every floor type and cause your business to either be an unhealthy environment for your customers and employees or an unattractive environment that will deter prospects. Laminate floors and carpeting can grow mold or mildew, hardwood can experience bulging and buckling, tile can develop a hollow sound, and stains can show through on linoleum. 2. Road salt can also do damage, not to mention that it’s hard to remove (regular cleaners won’t do the job). The salt being used outside to clear the ice off of roads and sidewalks may increase outdoor safety, but it’s not doing anything beneficial for your floors when it gets tracked in on an individual’s shoes. Taking a look at the impact that saltwater has on metal goes to show how corrosive seemingly innocent salt, combined with moisture, may be on your floor, potentially five times faster at damaging your floors than regular snow. And it’s not so easy to remove the salt from your floors either due to its alkaline pH. 3. Melted snow and ice pose a safety risk to your customers and employees. Not only does snow and ice make your floors look bad and cause potential respiratory issues for your customers and clients from the mold and mildew present, but it also makes all individuals who walk onto your premises susceptible to a slip-and-fall accident. Water on the floor can reduce the friction between an individual’s shoe and the ground, putting them in danger of falling and getting a head injury or breaking a bone. While salt stains, snow and ice may seem pretty scary to your business right now, there are simple solutions you can start implementing so that you can relax a bit more and enjoy the holidays. 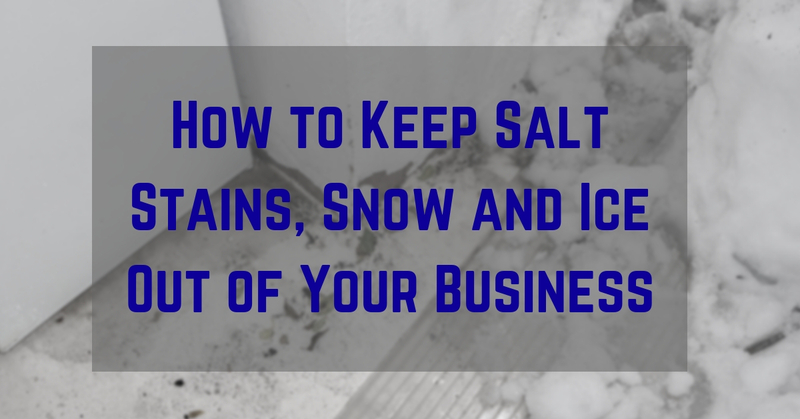 First and foremost, it’s integral to understand where the salt stains, snow and ice are coming from, and that’s from the shoes of almost every person that walks into your business. Therefore, even if you clean up once, these culprits of floor damage will inevitably come back. That’s why we recommend renting floor mats for use at all entrances of your business space. What these mats essentially do is scrape off and hold onto the dirt, snow, and salt at the bottom of your customers’ and employees’ shoes. This reduces the spread of unwanted dirt and moisture onto your floors. But unfortunately these mats can only do so much if they are not well-maintained. When you acquire mats through a floor mat rental program, you receive mats that will be completely laundered and maintained for you, so you can worry less about the accumulation of snow and ice. If salt residue still makes way onto your floors, it’s important that you use the proper tools to clean it up. Because salt is alkaline, neutral cleaners actually make the problem worse by raising the pH of the salt. Instead, you should focus on neutralizing its pH by using something acidic for cleaning. We recommend a solution of distilled white vinegar and water to neutralize the residue, but make sure to do your research based on your floor type so as not to cause any further damage. You also want to make sure that you use a quality floor mop, also through a rental program, that is delicate enough not to damage your floors but strong enough to handle this tough cleaning task. While you should keep an eye out for salt stains, snow and ice appearing on your floor so as to make sure that it gets cleaned up right away, you also need to focus on your other business tasks. With NDC Mats, you can keep your floors cleaner during this winter season and you’ll get to spend more time creating a wonderful holiday experience for both your customers and employees. To learn more about our mats and mops, contact us today at 800-238-2387.